Speaking exclusively to Yeni Şafak daily about their terrifying ordeal, Uyghur refugee mothers detailed the hardships they faced in their homeland and the tough choices they had to make in order to escape. Mother of three Dilnur Enver sought refuge in Turkey with her five-year-old daughter Tenzile, after being forced to abandon two of her children in China. Her parents were taken hostage by the Chinese government and Dilnur has since lost contact with them. 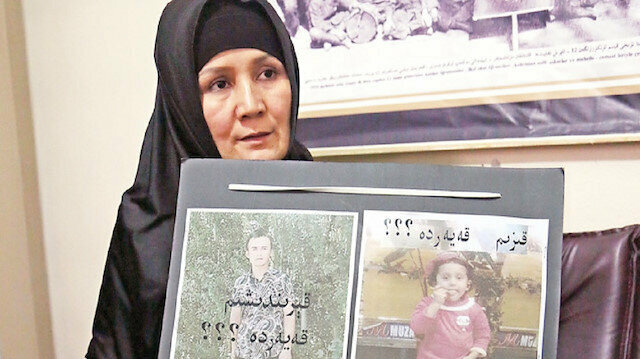 Her four-year-old son İhsan and seven-year-old daughter Nezire stayed back in Kashgar and Dilnur has been unable to get in touch with them. “If I return to my country, I know I will immediately be sent to the camp. For me, this choice is worse than death,” said Dilnur. Dilnur said all her family members warned her against contacting them since the Chinese government taps Uyghur Muslims’ phone calls in East Turkestan, forcing her to sever all ties to her homeland. After giving birth to her third baby, Rabia Gül received a seven-year prison sentence and had to raise the unregistered child for four years in secret from government institutions due to China’s two-child policy. “If I didn’t flee to Turkey, I would have been sent to the torture center they call a ‘camp,’” said Rabia Gül. Gül’s infant girl is currently being raised by relatives discreetly.